The title track “Give Me The Night” and “Love X Love” were quite popular on the R&B radio stations while “Star Of The Story”, “Love Dance”, “Turn Out The Lamplight”, and “Midnight Love Affair” were a favorite of the late evening quiet storm formats. Benson’s soulful remake of “Moody’s Mood” introduced me to a woman I would later love, Patti Austin. His instrumentals “Dinorah, Dinorah” and “Off Broadway” showcased his masterful guitar playing. Benson is backed on this album by some of the finest musicians and vocalists of the day including George Duke, Herbie Hancock, Greg Phillinganes on keyboards, Lee Ritenour on guitar, Paulinho da Costa on percussion, and Diva Gray, Jocelyn Brown, Jim Gilstrap, and Patti Austin on backing vocals. This entry was posted on Friday, March 7th, 2003 at 6:18 am. 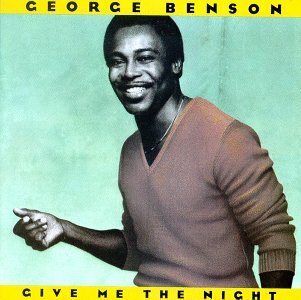 It is filed under Flashback Friday and tagged with Flashback Friday, George Benson, Give Me The Night, Quincy Jones. You can follow any responses to this entry through the RSS 2.0 feed. you know…growing up, it took me a while to realize that George Benson the singer was the same as George Benson the guitarist. i identified the ‘two georges’ by the music….years later i am happy to be able to know the TWO as ONE great musician. DON’T YOU EVEN GET ME STARTED! This is by far one of my favorite disks. Damn, you. Now, I wanna leave work early so I can go home and pop it in (if EJ has returned it). Oh, and his stuff with Masters At Work is genius, too. i’m ’bouta play it RIGHT NOW! I like Randy Crawford’s version, especially the Chill Night mix found at the end of her album Naked and True. Mm Mm Mmmm. all I’ll have to comment is.. I do have to say that Randy did put her foot in it. And as quiet as it’s kept, I love that entire CD and actually purchased a copy of my own. I remember sitting in junior high loving his songs. Wow. My, oh my! I screamed when I saw that beloved album cover! A wonderful recording from an amazing artist. “Star of the Story” still makes me swoon. Good to see Greg Phillinganes name again. His keyboard playing can be found on many great recordings crossing all genres. I LOVE this album – Love X Love and Give me the Night are both hot, hot, hot! As for Randy’s version – this is about George, not about Randy. And I find it hard to put them in the same conversation anyway! BUT, George is the bomb and this album is one of his classics!!! George Benson is wonderful — I’m still in love with his work on Mary J. Blige’s “Seven Days,” — I would have to say that’s when Mary J. Blige matured when it came to music. Hee hee, ‘Give me the night’ was one of the first 45s I bought, and I would like to send a shout-out to the long-gone Musicland at Hilltop Mall and their rack of 99¢ singles. I miss those. I love George. I had just purchased “TheBest of Randy Crawford” so it’s really good to see this dialogue going on.